Everyone says the Wii is a gimmick, but does anyone really understand the fundamental, overarching, general principle that makes it a gimmick? Knowing this would prevent the creation of another failure. It’s the ambiguous controls. This is the problem with all motion control gaming. E.g. PS3 Move, Xbox Kinect. As a result, the games are only fun for a bit, aka “casual gaming”. I consider controls to either be discrete or variable. Buttons are an example of discrete controls because they have a distinct on and off state. There is no ambiguity. You press a button and see the resulting action on the screen. Examples of variable control are the L/R trigger on an Xbox controller, swiping a mouse, and swiping a finger on a touchscreen. You can press the L/R trigger from 0 to 100 percent, and the resulting action is performed from 0 to 100 percent. You can angle an angry bird 0 to 90 degrees, and the resulting action is performed 0 to 90 degrees. Motion control can be considered variable control but it’s extremely ambiguous. For a controller to be good, I believe it needs to accurately and precisely record measurements. In motion control gaming, the gameplay/fun doesn’t come from the actual game. Fun comes from trying to figure out if the movements you’re making are actually being translated into actions on the screen. Is the sensor reading the velocity you swing your arm? If you’re standing at an angle, is it still detecting your hand? Is it recording leg movements? Is swinging the entire arm pointless because you can just flick the wrist? Is it sensing forward and backward movement? Is it tracking your position relative to the screen? Totally ambiguous. Motion control games are similar to those new Street Fighter-like games where you mash buttons, without a clue as to which button maps to which move, and hope for the best. The fun factor wears off fast. Admittedly, the Xbox Kinect counters ambiguity by showing your body on the screen. It pretty much just records body position on a two-dimensional plane. How would you ever get a character to move forward? Say, “Avatar, forward.”? Having no discrete buttons really limits what the Kinect can do. Even a touchscreen has distinct on/off states – touching and not touching the screen. 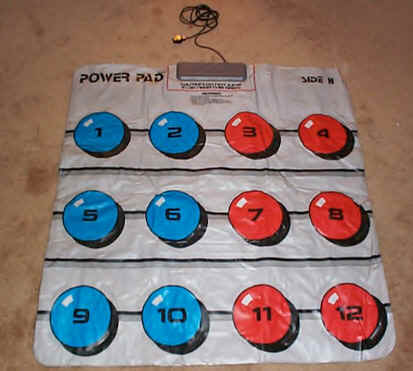 The old Nintendo Power Pad is better than any modern motion control because it actually has discrete buttons to step on.